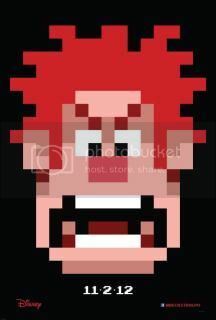 As John C. Reilly’s Ralph notes early in Wreck-It Ralph, video games have gotten violent and scary. It’s no small wonder that I’ve generally given up on playing video games – it’s a pastime that simply doesn’t engage me like it once used to. But with its retro gloss, Wreck-It Ralph institutes a very careful and manufactured attempt to revitalize the gamer inside of me. With plentiful references to games of old, the desire to dust off the controller is palpable. But as the picture attempts to shake my cynicism of being a film constructed under the guise of licensing with its heartfelt gestures of genuine tenderness, the overarching sense that Wreck-It Ralph depends on referential material to progress its narrative hinders much of its efforts. Conceptually unique if not narratively cliché, Wreck-It Ralph functions as a generally-agreeable animated film that is elevated by its exceptional visual presentation and superb voice work. Characters roam the visual terrain in a manner that matches their in-game movements. This sort of visual cue is one of the more interesting referential uses of its material, though so much of the picture depends on superficial qualities that don’t transcend or elevate the material in a significant way. What does elevate the material is John C. Reilly and Sarah Silverman’s voice work for the picture. Rarely am I grabbed by the voice work of an animated film, but Wreck-It Ralph provides some of the most memorable and distinctive examples of this type of craft. The tenderness and vulnerability that they exude through their characters instills the material with so much more depth. Playing wounded characters on the verge of achieving social acceptance, both Reilly and Silverman inject their avatars with enough humanity to give this film serious emotional heft. The plotting of Wreck-It Ralph adheres to a very formulaic series of events that rarely deviates from expectations – but the grounded way in which Reilly and Silverman voice these scenes is impeccable. Tied together with such gorgeous animation, Wreck-It Ralph is as much a technical achievement as it is an actor’s showcase. The material lacks depth beyond the qualities that Reilly and Silverman provide though. It’s not as if my expectations that a film like this would transcend its superficiality, but the rather unique premise it presents is failed by dull plotting. It’s all a little too composed, a little too manufactured to ever register on the human level it yearns for. For all its qualities, Wreck-It Ralph has its highs and lows that average out to something just a little above average.